We all do saving web pages while surfing for quick access later or to archive important information. While you can always save pages to your computer, it will be useful to save them directly to cloud services like Dropbox and Google Docs, that way you will have access to these documents anytime you want from any device. 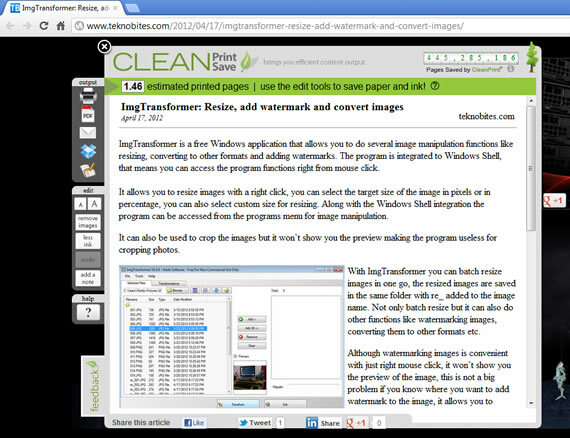 CleanSave is a Google Chrome extension that makes it easy to save web pages to Dropbox and Google Docs. Not only saving web pages to these services but it also helps you in cleaning the web page before saving. It also allows you to print these cleaned documents, this feature is quite useful for me. I am using Printwhatyoulike.com currently, which is also a good service for removing clutter before printing. It automatically removes headers, footers and all the clutter and leaves only text and images from any page. You can also remove images from web documents before saving to other places. You have the option to convert pages to PDFs before saving or you can save them as text files. If you want to have images in the documents PDF is better way to save. It also allows you to save web pages as PDF files to your computer, but for that purpose alone this extension is not required as Chrome has inbuilt functionality to print pages as PDFs. After installation of the CleanSave extension you can find the cloud icon on Google Chrome near the wrench menu. Clicking on this icon to use when you are on a webpage, it will load an iframe on top of the page with options to save or print web pages. Another useful feature this extension has is it allows you to increase the text before printing for better reading. While printing you can select the button “less ink” which makes text lighter to save ink.